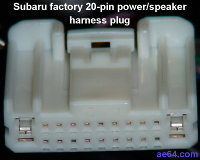 This table shows the pin assignments for Subaru's 20-pin factory radio harness. Column "A" lists the wire colors used by aftermarket manufacturers on installation harnesses and aftermarket head units (HUs). Column "B" lists the wire colors on the factory Radio Connector in the car. This is the plug whose wires disappear behind the dash and connect to the speakers, power, etc. Factory colors in Legacy/Outback are different. Colors on OEM accessory harnesses (e.g., under-seat subwoofer, BlueConnect, Media Hub, etc.) are completely different than either factory or standard aftermarket colors. When two colors are listed, the first is the main color and the second is the stripe color (main/stripe). The stripe is much thinner. Pin 1 ("Illumination +") is +12 volts when you use the headlights switch to turn on the parking lights or headlights. This pin is open-circuit when the lights are off. For nearly all aftermarket HUs that have a wire for "dimmer" or "illumination control," you should connect that wire to the Subaru's pin 1. For additional tips, see the section "Illumination Control Wire" in my 20-pin HU installation guide. Pin 2 ("Dimmer" or "Illumination –") varies as you adjust the car's dimmer knob. On Subaru models up to around 2006, this line varies in voltage from close to 12 volts (with the knob at the "dimmest" setting) down to 0 volts (with dimmer knob at "brightest" setting). Note that this is backwards from the method used in some other cars. The car's instrument panel lights are connected between the illumination and dimmer lines. So the bulbs effectively "see" a range of voltage from 0 volts (dimmest) to 12 volts (brightest). Recent model years have changed to LEDs for the instrument panel lights. In these cars, the dimmer wire provides a pulse-width modulated signal (12V switched rapidly "on" and "off"). The dimmer knob adjusts the percentage of "on" time, causing the LEDs to appear dimmer or brighter. (G) On some aftermarket 20-pin forward harnesses, pin 1 is Orange / White. Most do not have a wire for pin 2. Pin 3 gets +12V when you turn your ignition key to "Accessory" or "On." This wire is what causes the radio to turn off when you turn off the key. Some HUs label this wire "Ignition." Wires connected to the car's Steering Wheel Audio Controls (SWCs). In Subarus, all SWC wires go directly between the HU and the wheel. Neither side connects to ground or a voltage in the car. Inside the wheel, the buttons connect to a network of resistors. The HU sees a different resistance for each button (and a higher value when no button is pressed). Many HUs today can work with OEM SWCs. However, most HUs require a separate interface module (to convert from the Subaru's resistors to what the HU expects to see). 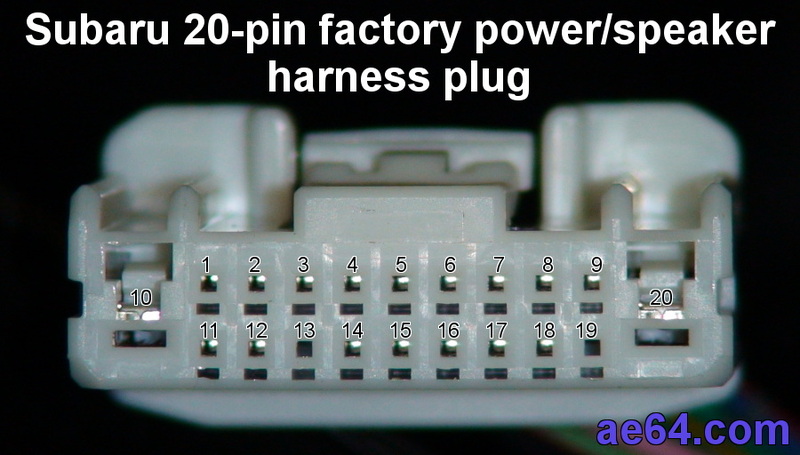 See additional tips in my 20-pin HU installation guide. On most models/years: Pin 4 connects to the buttons for Mute, Volume Up/Down, Mode, and Channel/Seek Up/Down. On 2011–up Impreza/Forester models with HUs with Bluetooth: Wheel no longer has Mute button. Mode button is wired with other buttons on pin 13. On 2010–up Legacy/Outback models with HUs with Bluetooth: Wheel no longer has Mute button. Pin 9 powers an antenna booster amplifier (for the foil antenna on the rear glass or short antenna on the roof). Subaru OEM radios send +12V to this line only while you're in AM/FM mode. When installing an aftermarket HU, make sure this wire gets no less than 12 Volts. See the tips in the section "Power Antenna Wire" in my 20-pin HU installation guide. The "correct" aftermarket color for this function is Blue. However, since this 20-pin harness first appeared in some Nissans (which use pin 9 for a speaker amplifier), on many radio installation harnesses this wire is Blue / White (the standard color for speaker amp remote turn-on). Whether your harness has Blue or Blue/White on pin 9, you should connect it to a wire on your HU that gets +12V when the HU is in AM or FM mode (see previous note). CAN (Controller Area Network) is a data bus that allows various devices in the car to communicate with each other. On Subaru's 2008 Impreza wiring diagrams, these wires from the radio harness are on a low-speed network with the Body Integrated Unit, A/C Control Panel, and the Combination Meter. No aftermarket HU (that I'm aware of) can be connected to these wires. Some factory radios use this for speed-sensitive volume control. See additional tips in the section "CAN Data Bus Wires" in my 20-pin HU installation guide. Models with the newer dash design (2012–up Impreza & Crosstrek, 2014–up Forester, 2015–up WRX & STi) dropped CAN bus from the radio harness. (N) 2010–2012 Legacy/Outback with phone/BT SWC buttons: On/Off-Hook and Talk buttons. These buttons share the same common wire (pin 14). Note: In 2012–2013 models with OEM HU CE617U1, this signal is on pin #13 instead of 11. (P) Impreza/Forester with phone/Bluetooth SWC buttons: Mode and On/Off-Hook and Talk buttons. These buttons share the same common wire (pin 14). (R) Pin 20 connects to the car's battery (through a fuse in the panel under the hood) and gets +12V all the time. Pin 20 has a larger-gauge wire. 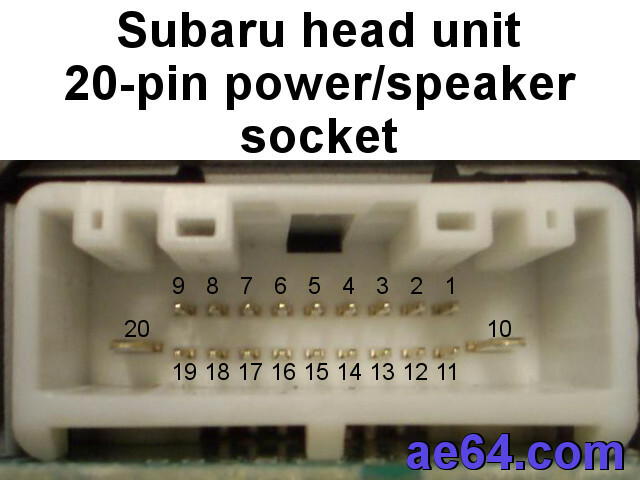 For several more tips on installing an aftermarket HU with a Subaru 20-pin harness, see my 20-pin HU installation guide. Speaker wire factory colors (shown in column B) are as they appear at the radio harness. In many models, the wire colors change along the way to the speakers. The factory wires (column B) sometimes have complimentary pairs (e.g., White/Black and Black/White). Don't get these mixed up! The stripe color is thinner than the main color. It helps to work in bright light. Tracking down blown fuses is no fun and wastes time you could have been enjoying your new audio system. So when you work on the factory wires, first disconnect the cable from the negative terminal of the battery. If you are repairing a car's damaged or missing factory harness using an aftermarket reverse harness, connect the aftermarket colors (column A) to the corresponding car's colors (column B). 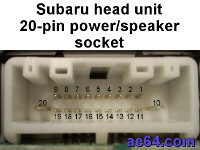 To install an aftermarket amplifier, subwoofer, sound processor, Line Output Converter (LOC), gauge, etc., see the installation instructions for my Subaru 20-pin combined harness. 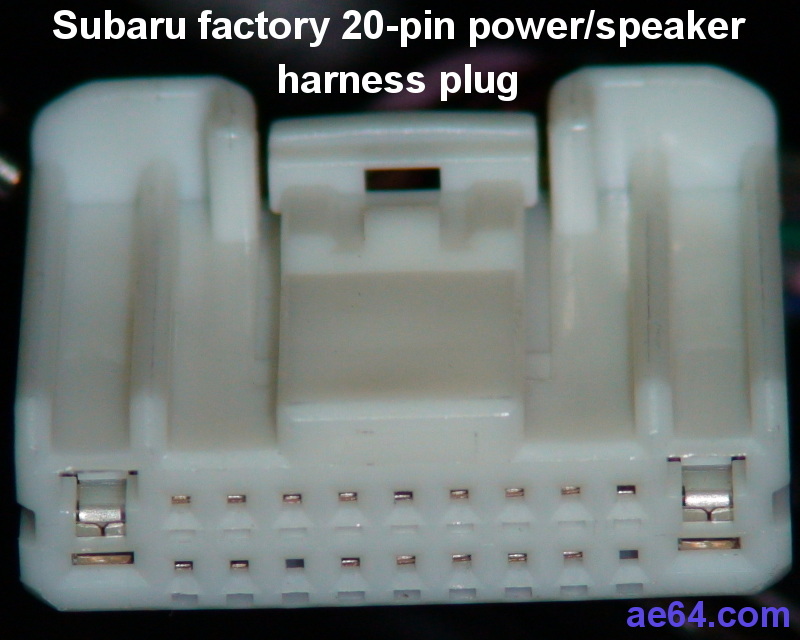 Home Page — Links to radio harness pin-outs for other models/years and other useful Subaru information. © Copyright 2010–2014 by David Carter. All rights reserved.